Located a few hours’ drive out of Auckland, Rotorua is a mecca for backpackers, adventure travelers, nature lovers and luxury travelers alike. Situated in the midst of one of the most tectonically active regions in the world, Rorotua boasts thermal parks, hot springs and mud pools, many of which can be enjoyed by tourists on any budget. In recent years Rotorua has become something of a pilgrimage destination for Lord of the Rings fans, eager to see for themselves the locations that director Peter Jackson earmarked as his top choice for the backdrop of his Lord of the Rings and Hobbit movies. Adventure junkies can explore nearby glowworm caves or go ZORBING, and in their down time rent bikes and explore the Redwood Forests, which are free and open to the public. 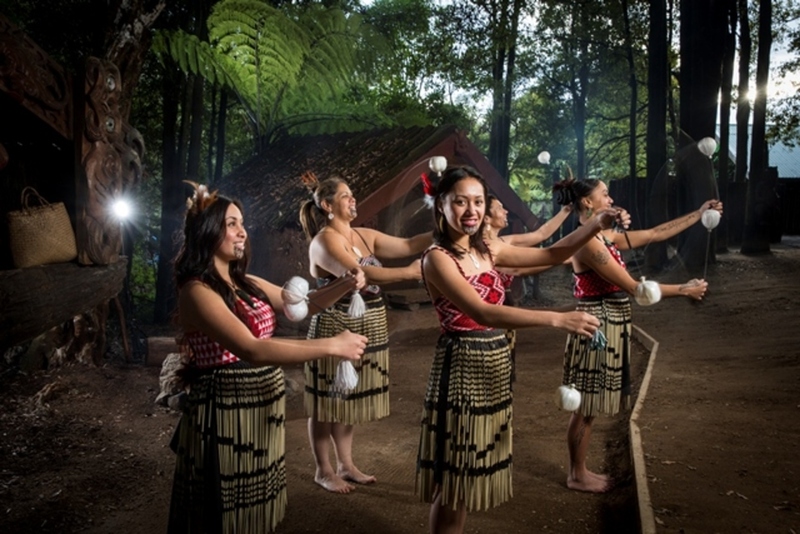 Whether you’re interested in BEING A HOBBIT FOR A DAY IN THE SHIRE or getting a healthy dose of culture in the cradle of Maori territory, Rotorua has a little something for everyone. My guide offers advice on where to stay and what to do in the city, offering both budget activities and a few splurge activities for good measure. Crash Palace is my go-to recommendation for backpacker’s lodging in Rotorua. Located just off the main drag, Crash Palace has the advantage of being spacious, comfy, welcoming and quiet. It’s a short five minutes’ walk from the nearest grocery store (where you can pick up ingredients to cook in one of their two fantastic kitchens) and a two minutes’ walk away from the town center, where you can catch the bus to activities located outside of town, including Zorbing and nature walks, or rent a bike so that you can go exploring without having to rent a car. The atmosphere inside Crash Palace is great; the first floor is open and comfortably appointed, with a combined dining and movie-watching room, a smaller room with a pool table just off reception, a kitchen, a toilet, a computer room and an outside patio with a hot tub. Guests are given a key code that they can use to get upstairs, where the rooms are located. 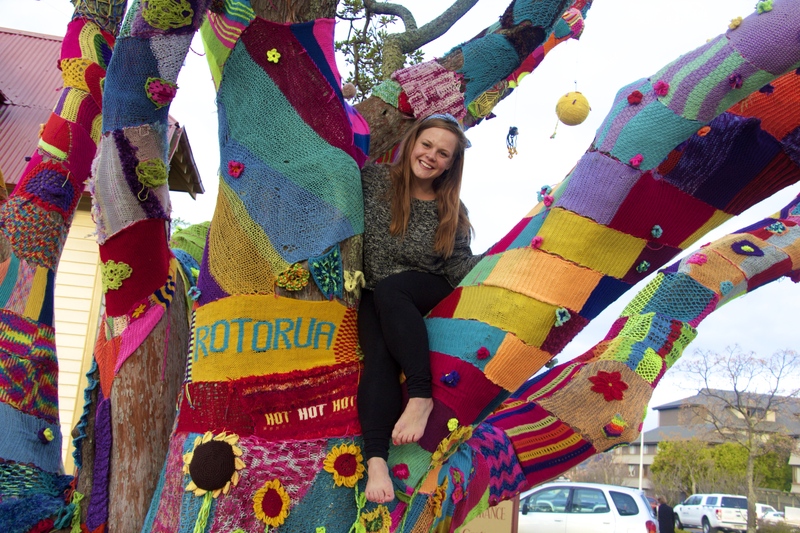 The owner and manager of the hostel is friendly and happy to answer any questions you have about the hostel, about Rotorua and about the activities accessible from the area. Crash Palace is hooked up with loads of great deals and discounts, including a reduced rate for Hobbiton and $10 off OGO (Zorbing). The hostel offers free wifi, which is a huge bonus for New Zealand and a major relief for backpackers who are tired of paying out the nose for internet access. I would definitely recommend having your own computer, though, as the computer in their computer room can run a little slowly if you need to back things up or upload images. The hostel also runs a nightly program for its guests, which can range from a free family dinner to pub crawls to movie nights. Pasta and rice are always available from the front desk for free, and alcohol can be purchased from the front desk bar as well. As a minor-league nerd, I have to say that my favorite paid activity in Rotorua was going to Hobbiton. 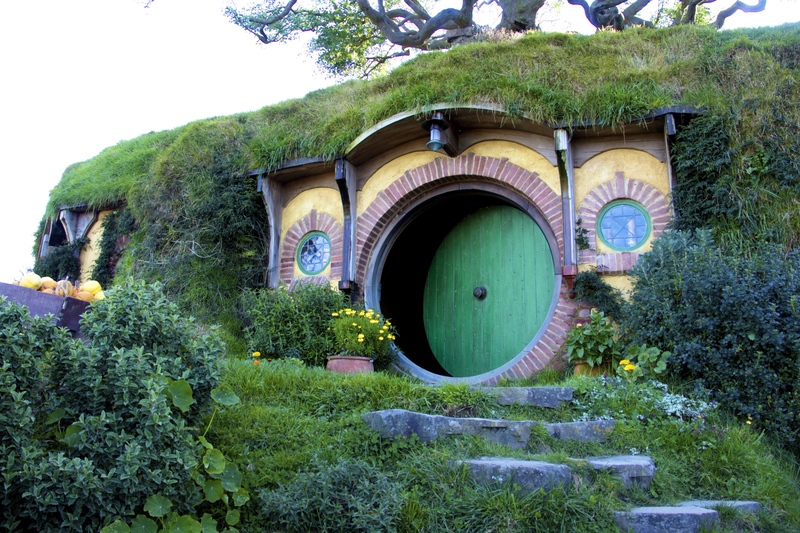 Even if you aren’t a huge fan of Lord of the Rings, the Hobbiton tour is one of Rotorua’s must-dos. The tour I did picked me up right at my hostel on the way, giving us bits of information about the tour as we neared the farm on which the movie set is located. The set itself is beautiful, nestled in the rolling hills of New Zealand’s countryside, and the Hobbit holes look cozy enough to live in! Spend some time ambling around the Shire, snap a few shots of Bag End, listen to your guide’s super-informative facts about the set and the creation of the movies, then end your day with a complimentary cider, ale or ginger beer at the Green Dragon. 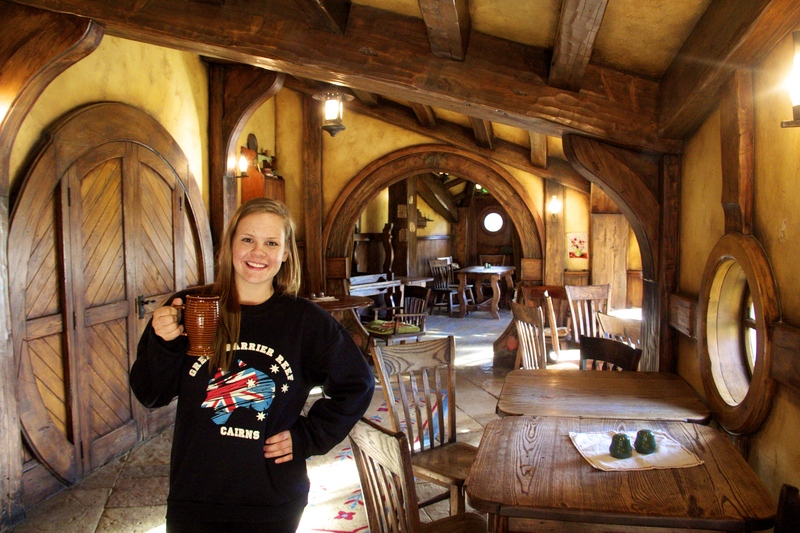 If you’re interested in learning more about exploring Hobbiton, check out my in-depth post about it HERE. Although I loved everything that I did in Rotorua, Ogo stands out to me as something very quintessentially Rotoruan. Ogo, better known internationally as Zorbing, was founded in our very own Rotorua, which remains one of the few places where you can actually have an authentic Zorbing experience. So what’s Zorbing, you might ask? 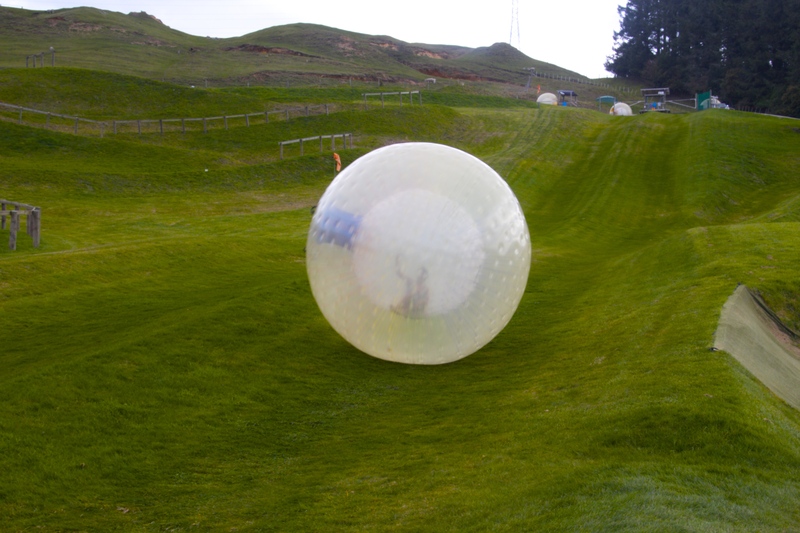 Zorbing is essentially rolling down a hill in a giant, soft-plastic hamster ball. It’s crazy fun and a great activity to do at any age, and would be a great activity for families with hard-to-please children. If you’re interested in learning more about Ogo/Zorbing, check out my detailed blog post about it HERE. 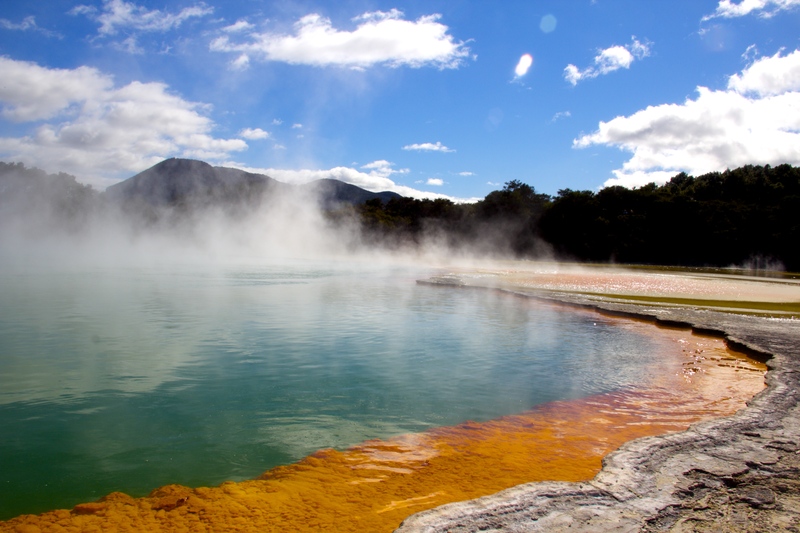 If you’re lucky enough to have a car or know someone who has a car, I would highly recommend driving out to Kerosene Creek or the Hot-and-Cold thermal pools, which are located about twenty minutes outside of Rotorua Town. The hot pools are free and open 24 hours a day, which makes them great spots to lounge around on a lazy Sunday afternoon or on a romantic date night. They can be a little bit tricky to locate and aren’t maintained to touristy standards, as some other for-profit thermal pools are, but they are absolutely worth the effort! Visiting the thermal pools was one of the highlights of my trip and, when I was there, were enjoyed by locals and tourists alike. Pro tip: if you’re visiting at night be sure to bring flashlights and candles with you, as there is no artificial lighting on-site. Another free activity located just a twenty minutes’ walk from the Rotorua City Center and Crash Palace. 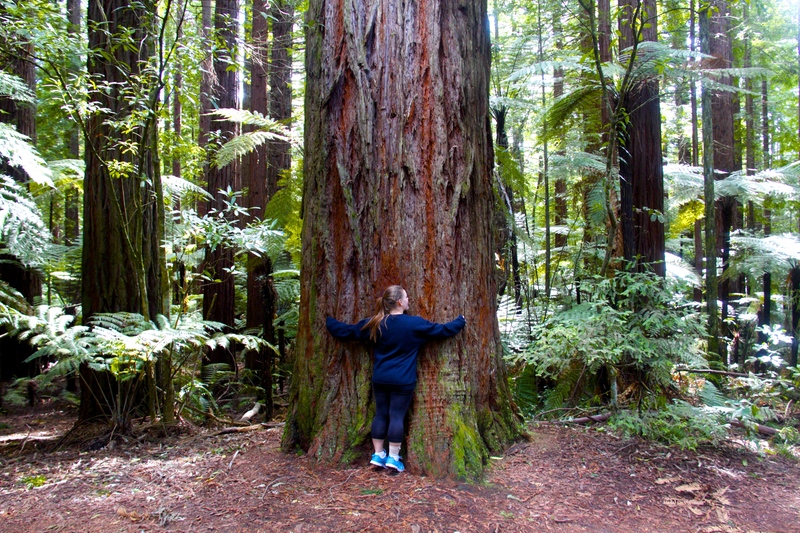 The Redwood Forest is an absolute treat, with walking paths for varying levels of endurance and fitness (ranging from 30 minutes to 8 hours, ouch!). The forest itself is beautiful and huge, with massive Redwood trees sprouting up around aquamarine colored creeks. The Redwood Forest is truly something out of a fairy tale and makes for a great natural escape. Tour busses run to the Wai-o-Tapu Thermal Wonderland several times a day, and I’d recommend going in the morning in order to catch their daily Lady Knox geyser show. The Thermal Wonderland is chock full of amazing, other-worldly geological oddities, including the toxic looking Devil’s Hole, the brilliant orange geothermal pool and the super-hot mud pools. There are three walks available to Thermal Wonderland explorers, ranging from 30 to 75 minutes. 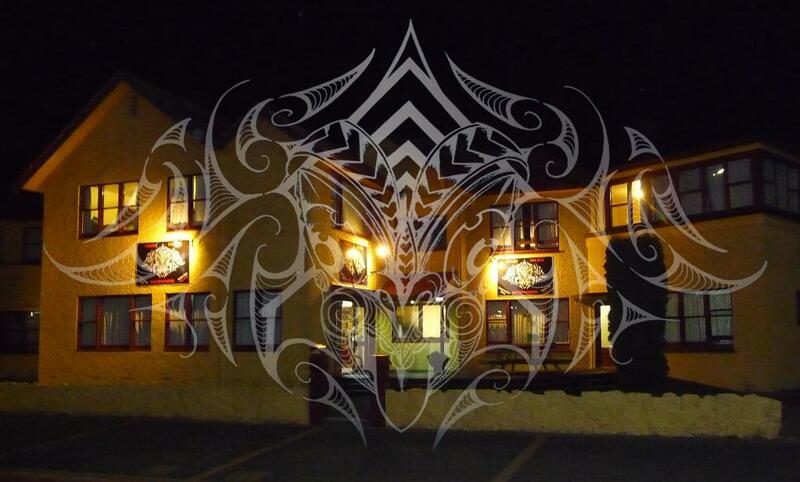 While I did not personally attend any of the Maori evening shows, I heard that they were absolutely incredible and offer an up-close-and-personal introduction to Maori culture. The buffet dinner is apparently to die for and the shows are said to be fantastic as well. This would be very much worth a look if you’re interested in learning more about the culture of the Maori people. 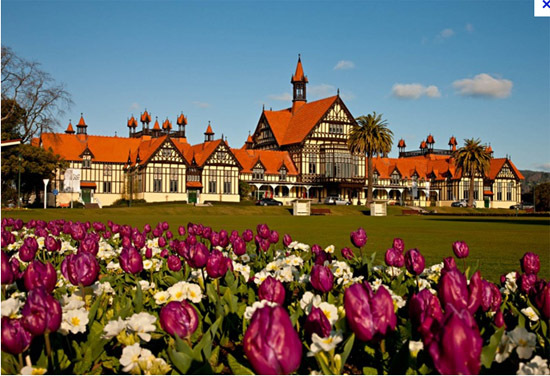 The Government Garden is a gorgeous, sprawling park just outside Rotorua City Center. It’s a nice place to take a walk, featuring some of its own thermal activity, which you can view free of charge. Best when explored in the daytime, as it can be a little dangerous come nighttime. Even though I only had five days in Rotorua, this little city absolutely won my heart. With friendly citizens, natural wonders and Hobbity delights abound, I found myself getting incredibly comfortable with Rotorua and its surrounding areas. Crash Palace is the ideal place for backpackers to stay given its proximity to attractions, its cost and its closeness to the grocery store, which is key for travelers on a budget. Overall an amazing place to spend a couple days, though I certainly could have spent a lot longer there and am dying to go back!